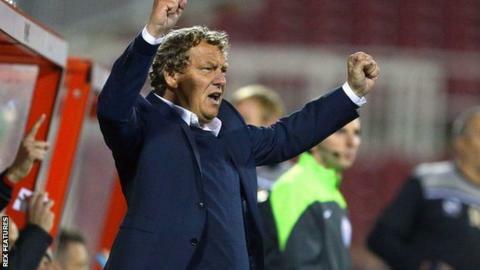 Swindon Town owner Lee Power says the League One club will name their new manager on Tuesday. Power has been in charge of first-team affairs since he sacked Mark Cooper on 17 October and the club are currently second bottom of the table. "It is that straightforward, it is just a case of tying up a few loose ends. There will be a new manager on Tuesday," he told BBC Wiltshire. "This is a massive opportunity for anyone as we are in a false position." The Robins, who reached the League One play-off final last season, are only above bottom club Crewe because of their superior goal difference. And they are without a win since beating Crewe 3-1 at the start of September. Power confirmed the new manager will not be Tottenham coach Ross Embleton, although he is earmarked for another role at the County Ground. "I am speaking with Ross about another position at the football club, but not the manager's position," continued Power. "He is aware of the brand of football we are trying to play. "I think he can bring some benefits to the club and he's someone we are trying to tie down and bring in as a coach."